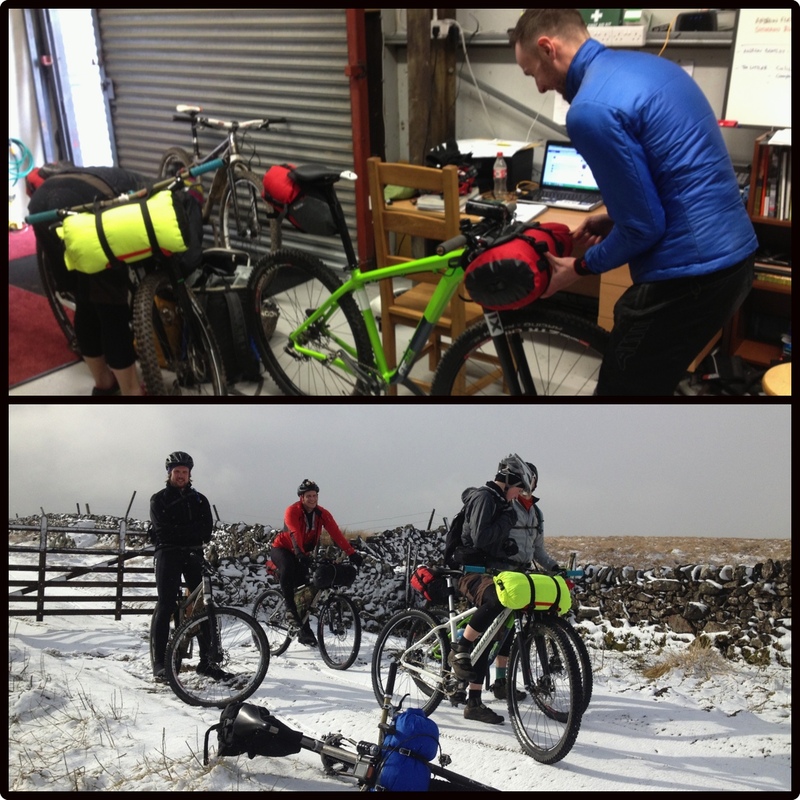 YORKSHIRE DALES WEEKEND BIVVY TRIP | Riders Cycle Centre. Cycle repair and service workshop. 50+ 5Star Google reviews. Bicycle consultancy. Custom wheel & bike builder. Maintenance courses. The UK has been through the wringer weather wise for quit a while now so planning an weekend overnight mountain bike bivvy trip was always going to depend on what mother nature would present us so with the Met Office forecasting snow and bitterly cold night time temperatures, warm bivvy equipment was resurrected from the cupboard and my fellow adventurers warned. 10am at Riders Cycle Centre and 5 brave souls gathered with steaming brews cupped in hands. We discussed equipment, eat the fantastic muffins that Tom & Jenn made us and began strapping sleeping equipment to handlebars and seat bags to seat posts. With a minimal amount of tinkering which was rather impressive we left RCC with snow falling from white skies. Our miles leaving Skipton were eaten up with quiet country lanes but the climb out of Eastby up onto Halton Moor had the singlespeeders amongst us (everyone except me) straining and grunting to the summit. We headed towards Appletreewick and our 2nd long climb up along Skyreholme Bank. We now were off road and our rocky track beneath us was covered in snow. Not deep or thick but a light covering and fluffy enough for tires to cut through. We climbed slowly with heavy bikes which required a change of technique to compensate for added weight. We intercepted the B6265 to Patley Bridge which was to be a quick stop off for a brew and some brunch. With Tea, bacon butties and tea cakes inside us we headed north and the bridleway skirting Gouthwaite Reservoir. We climbed up on to Fountains Earth Moor and headed towards Scar House Reservoir. Our route meant we were high up and the snow was adding to the beautiful views. Our virgin Dales rider, Rob (had the pleasure of meeting and riding with Rob at the Cairngorms ride last year) was treated to the full X factor. We all had to remember to watch where we were going rather than are eyes scanning picture postcard views. This was where Simon said goodbye and headed back to Skipton. Thanks for joining us Simon (an impressive 60miles on a singlespeed once he returned home). Tom, Jenn, Rob and I continued our climb that was to then descend into Arkleside. I say descend very loosely. I knew the that the trail was hard packed, rutted and with the odd boulder or pebble littered beneath the 3inch snow blanket. So descending was undertaken at a very sedate pace which still didn’t prevent me from taking a tumble. With knee on rock pain (and torn tights) flooding my system and with Jenn near by I subdued the swearing and counted to 10 several times. Back on the bike we continued downwards and where soon back onto firmer, safer but now considerably colder conditions. We cycled through Carlton, Melmerby and across to West Burton. Melmerby Moor and the snow covered road brought more fantastic views and with tires crunching through compacted snow it became a section in which we chatted and reflected on the vistas. Once at West Burton we headed north again and to our overnight spot at Aysgarth Falls. Our plan was to eat at the Hotel and then camp at the falls but after a quick chat with the landlord we were kindly invited to camp in the hotel garden. We parked our bikes on the patio and hurried into the warm and welcoming arms of the Aysgarth Falls Hotel. Local beer and hearty food and some interesting stories soon brought on bed time and we ventured back into the cold to make camp. Our location brought on a giggle or two. We chose a kids climbing frame as our bedroom for the night and after putting up the tarp (snow was forecast) we unwrapped our sleeping rolls, pumped up our Therm-a-rest’s and climbed into our cocoons. Brews on the go we compared our boiling times and Im happy to say my Jetboil reigned victorious :). 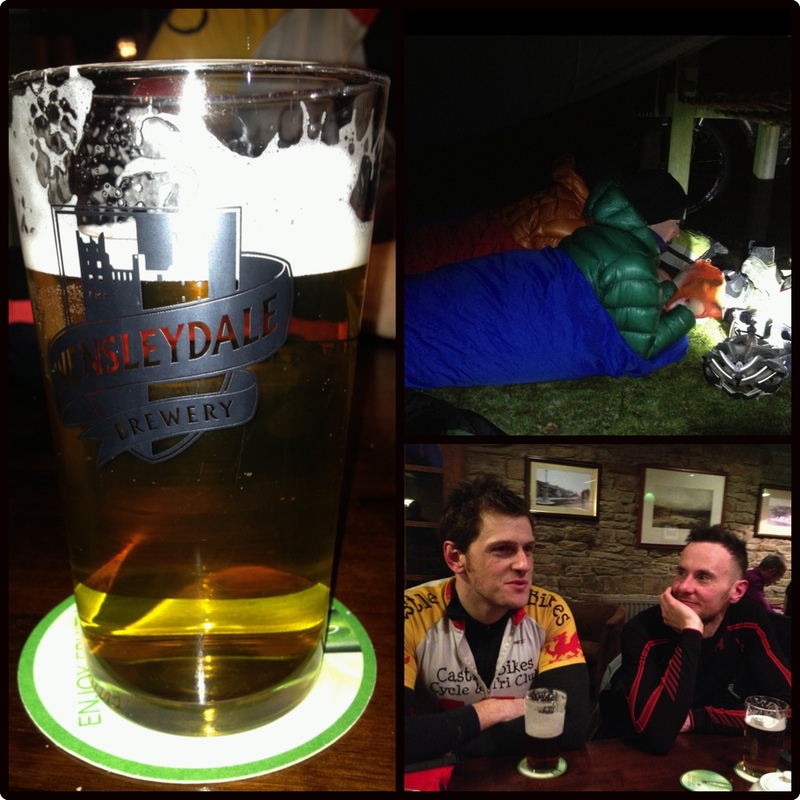 Our first day riding had put a testing 46 miles into our legs and it wasn’t to long before we all nodded off. Tomorrow was a new day, bring it on. Our second day in the saddle required us to put in a 70 mile day and with the challenging off road conditions this would be a tall ask so a little bit of route diversions was undertaken. After breakfast and some organised packing we set off into another cold day on our bikes. We headed west towards Bainbridge. It was quick miles on the road but gaining some warmth was difficult. Cam High Road soon sorted that out and after a few minutes of climbing we where soon to be stripping off layers and preparing for some hard ascending. The higher we climbed the thicker the snow became. At the summit the snow drifts pilled high against the stone walls and the 4X4 troughs where brimmed with snow but the right kind of snow, just fluffy enough to allow your tires to slice through. Remember, today was a long day so I wont reflect on the entire journey so Ill let pictures tell the story. The Dentdale Valley brought plunging temperatures and green fields. The climb up and over Whernside brought back the snow and the steep stone and step descent down towards the viaduct aboard rigid hard tails called for a strong grip and ample amounts of arm pump. 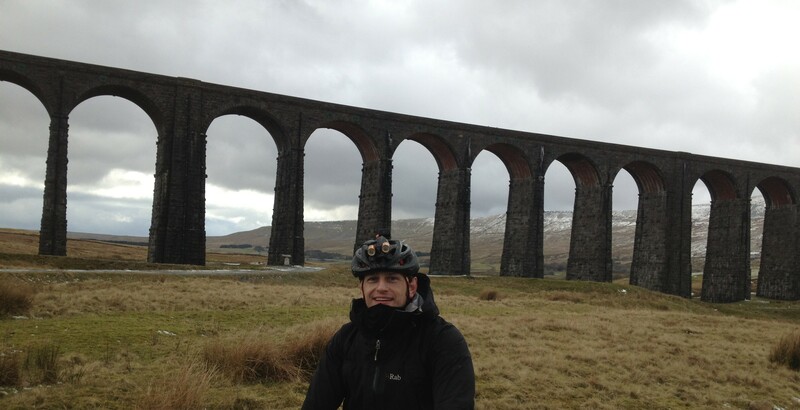 We cycled to Horton in Ribblesdale and the cafe over looking Pen-y-ghent. More tea and plates of stew or beans-on-toast fuelled the remaining 15 miles back to Skipton. Malham Tarn and Mastiles Lane still covered in snow where the last of our off road trails and once on the road at Rylstone we quickly entered Skipton and back to Riders Cycle Centre. Thanks again for Tom, Jenn, Rob and Simon for joining me on a great trip. For the tech head amongst you, here is my stead and equipment info. Titanium 29er frame with Pace RC31 rigid forks. 1X9 gearing. 36t front and a 11/34 rear. Hope/Stan Flow Sapim CXray spokes Tubless Maxxis Crossmark tires. USE Ti seat post and Flite Ti saddle. Carbon Ragley bars and Shimano XTR 160mm brakes. SRAM XO rear mech with a XO Grip Shift shifter. Alpkit Bivvy bag, sleeping bag and a Neo-Air Therm-a-rest. Montana clothing and Santini tights. 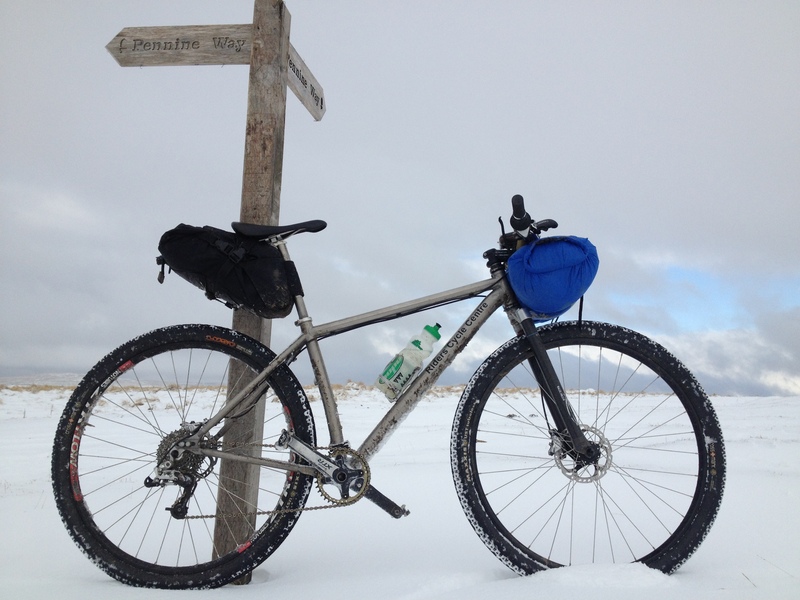 If you are interested in a guided bivvy ride in the Dales then please get in contact. All trips are taylor made to your requirements and abilities. Milage, routes and overnight camping can be changed or altered to cater for your group. Overnight bivvy trips are the best way to experience a little biking adventure and the Dales delivers fantastic riding terrain, routes, views and local hospitality.